A group of dedicated skaters came out to get a few more hours in at Philadelphia's Love Park. Mayor Jim Kenney lifted more-than-decade-long ban on skateboarding, allowing skaters until February 16, 2016 to shred the legendary skate spot before renovations begin. In an immediate sense, it centers around a name change – rebranding from “Franklin’s Paine Skatepark Fund” (FPSF) to SkatePhilly on Monday – and a full day of events to celebrate International Go Skateboarding Day on June 21. In a bigger-picture sense, it’s about uniting in an effort to use the granite slabs that skate enthusiasts painstakingly gathered from Love Park, the erstwhile skating Mecca. They hope to build a skate park in the city that, with the help of big-name sponsors, will incorporate many facets of the Center City spot. 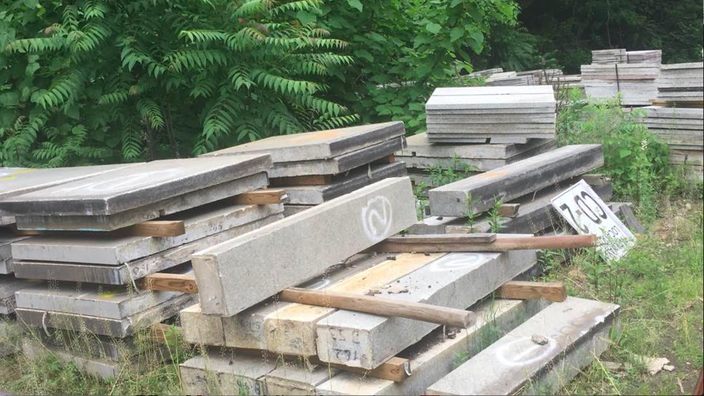 The granite is being stored at an unnamed (to avoid theft) location in the city, and organizers say they didn’t send nearly as much to Sweden as some reports would have you believe. Jesse Rendell, the son of the former mayor who’s heavily involved in skateboarding issues in the city, spoke to PhillyVoice this week about both efforts. “Stories like this give people the opportunity to throw dirt on us. It fractures the community when people can say, ‘I told you the skate park was bulls***,” Rendell said. In the years leading up to Paine’s Park’s opening in May 2013, the group gelled around that common mission of seeing a $4 million project through to completion. Those efforts have seen McCreesh and Granahan playgrounds join the city’s roster of seven or eight skate parks. All the while, though, some in the community didn’t have a greater sense of the group’s direction. That’s what the rebranding efforts hope to change. “With SkatePhilly, we want to make it something that’s a bit more all-inclusive, not that it wasn’t before, but we weren’t viewed as a movement,” Rendell said, noting that SkatePhilly will start with a social media push including posting videos from various sites and “becoming a resource” for the community. They hope to replicate groups like Tree Philly and the Bicycle Coalition of Greater Philadelphia, which have been able to coalesce enthusiasts around shared goals. Among the goals is replicating the city’s bike-trail system, linking all the city’s skate spots together in similar fashion to reinforce the thought that Philadelphia is already among the nation’s most skateable cities. As for the Love Park granite, Rendell said “the goal has always been to recreate as much of the famous skateable components as possible” and not to build a clone site, which would be impossible. “We can’t create another Love Park, but we don’t really know what we can and can’t do yet,” he said. Having the skate industry involved in it will help fill funding gaps considering the city and state wouldn’t exactly rush to spend dollars on such a project like they did with Paine's Park at Martin Luther King Jr. Drive and Benjamin Franklin Parkway. When the city closed Love Park for renovations, skateboarding enthusiasts salvaged much of the granite from the site for use at a future skatepark in Philadelphia. Despite reports to the contrary, enough remains in the city to be put to use locally. “We’ll never have another Love Park, but we can have a park with the opportunity to do something really cool if we get them to buy in,” he said. They’re not at a loss for granite, though. Rendell provided a slew of photos that speak to the claim that they preserved three or four levels from Love Park as well as the skateable ledges. After the salvage effort, they agreed to share some of the granite with Gustav Eden, the city of Malmö, Sweden’s official skateboarding coordinator. It was the Love Park mystique that drew Eden’s interest, and a donation was made to the organization to help support the local efforts. “We made sure we weren’t giving away stuff that would hurt our ability to complete the project here,” Rendell said, noting that the Swedes requested a lot more than locals were willing to part with. SkatePhilly has an array of skateboarding-related events scheduled throughout Philadelphia on June 21, 2017. None of that will come to fruition before SkatePhilly sponsors a slew of Go Skate Day events in Philadelphia on Wednesday, June 21. Go Skate Day Skavenger Hunt: From 8 a.m. to 4 p.m., SkatePhilly will host an interactive scavenger hunt with different skate-themed tasks at various skateparks and other locations throughout the city. Participants will snap photos, check in at specific locations, and answer trivia questions to accumulate points and win prizes. To participate, users will need to download the Scavify app, create an account, search "Go Skate Day" and join the hunt. The hunt will conclude at Paine’s Park where winners will be announced and prizes will be awarded at about 4:30 p.m.
Granahan Skatepark Ribbon-Cutting: At 11 a.m., elected officials and community stakeholders will join local skateboarders to officially open Granahan Skatepark at 6500 Callowhill St. Officials scheduled to attend include Mayor Jim Kenney, managing director Michael DiBerardinis, councilman Curtis Jones, and parks and recreation commissioner Kathryn Ott Lovell. DC Skate Team Demo: From 3 to 5 p.m., Philadelphia’s own Love Park legend Josh Kalis will join fellow DC team riders Evan Smith and John Shanahan for a skate demo session at Paine’s Park. Parks on Tap: Philadelphia’s first mobile beer garden is back for its second season and its stint at Paine’s Park starts off with a Happy Hour Fundraiser from 5 to 7 p.m., with 50 percent of all sales benefiting SkatePhilly.